Now with 20% MORE Magnesium! "I was using another magnesium and malic acid product for several years, thinking they were all the same. When I tried Fibro-Care™ on some of my patients as a test, they felt better! I now give Fibro-Care™ exclusively to all my patients with great results." Mark J. Pellegrino, M.D. IT'S IMPORTANT to make sure you are taking enough magnesium. One Fibro-Care™ is not likely to do it. A suggested formula is to take 2.5 - 4.5 mg per pound of body weight for normal individuals. Loose stools do not necessarily mean you are getting too much magnesium. You could simply be taking too much too fast. Start low (90 mg) and slow (one per meal). NOTE: There's a mitochondrial dysfunction found with FM too. You may need CoQ10 to help boost energy if Fibro-Care™ alone is not enough for your energy needs. Other Ingredients: Gelatin, Microcrystalline Cellulose, Magnesium Stearate, Magnesium Oxide, Silica. Manufactured without milk, egg, wheat, gluten, sugar, sweeteners, starch, salt, wax, artificial coloring or preservatives. Suggested Use: As a dietary supplement, take 2 capsules 2 to 3 times daily or as directed by your health care professional. Supplied by Albion Minerals. The Albion medallion sign is a registered trademark of Albion laboratories, Inc. Chelates and malates covered by Albion International Inc. U.S. Patents 5,516,925 and patents pending. Recent research says you are as young as your immune system so it's the best place to start when you want to be healthy. Being wise means taking proactive steps, like checking your D3 level with a 25(OH)D blood test. The Vitamin D Council recommends a level of 50 ng/mL, as does Mark Pellegrino, M.D., one of TyH's health advisors. This vitamin is nicknamed the "immunity vitamin" due to its system wide effect on hormones, regulator of so many of your body's functions, and because studies show those with the lowest levels are less disease resistant. Getting a D3 blood test is easy; just ask your doctor. With all the recent publicity on D3, most health care professionals recommend a D3 level, especially for its role in bone health. Many health experts recommend at least 200 IUs daily. If you're lower than the Council suggests, you may opt for a higher dose to get your levels up more quickly. It takes 3 months to change a D3 level so follow-up accordingly with your doctor to check on your progress. More on D3 dosing in our blog post. The second test is an RBC Magnesium Test, which unfortunately, some doctors decline to check. Magnesium commands a diverse array of enzymes responsible for sugar regulation, vitamins like D3, pain response, relaxes blood, nerves and muscles and so much more. People are less likely to think of magnesium for immunity but low levels are implicated in numerous diseases. This mineral helps reduce stress, a known insult to the immune system, and most importantly, provides energy to every cell. In fact, without optimal RBC magnesium levels, your body is compromised in its ability to perform efficiently. So get the test. Thomas Romano M.D. recommends a level of 5.5 mg/dL. If you show a deficiency, supplement with a highly bioavailable organic mineral found in Fibro-Care™ (Albion® magnesium bisglycinate). You'll be glad you did! Remember, if you're low, supplement – that's what supplements are for! 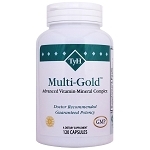 In some instances, a good multi-vitamin-complex like Multi-Gold™ will do you fine. But you'll never know your need if you don't test! Magnesium is a required nutrient yet as many as 75% Americans are low in this mineral. With over 300 biochemical reactions requiring its presence, it's no wonder so many research studies find the many ways it benefits health. A new meta-analysis looking at several studies again reinforced the effect of magnesium on blood pressure, specifically when supplements are taken in groups at high risk for developing hypertension. Pre-diabetes, diabetes, insulin resistance, and other chronic diseases are associated with hypertension risk. Eleven gold standard randomized controlled trials were reviewed, consisting of a combined 543 participants. I was looking for a more natural approach to deal with my fibromyalgia symptoms. I started with Fibro-Care™ several years ago, I saw an immediate difference in my pain and energy level. I have since added Fibro-GABA™, and just recently began to use 5-HTP. I am very happy to have found a website that understands fibromyalgia. I have not used any prescription medication for 2 years now, I feel that for the first time I am able to manage this illness that can be so debilitating at times. After suffering from both fibromyalgia, the side effects of Lyrica, including the personality changes, and not getting ANY of the benefits of the drug, I decided to try Fibro-Care™. Having gotten more benefit from herbs, without the side effects, my research indicated that Fibro-Care™ had the minerals recommended for fibromyalgia therapy. After using the Fibro-Care™ steadily for about ten days, I noticed that some of the pain, and the stiffness, seemed to be subsiding. After using it for two months, much of the muscular stiffness seemed to be dissipating as well. After using it regularly for several months, it appears that the fibromyalgia is gone. My muscles move normally, and the constant deep ache from the disease is gone as well. I use the Fibro-Care™ steadily, as recommended, and have for more than a year, and consider it a cure. Thank you for something I consider a miracle, since all the doctors could say was that it was something I could only get symptomatic relief from the Lyrica they were prescribing. I have been taking Fibro-Care for many years and I aways make sure to not run out! I still have bad and good days but I can't imagine what I would be like if I didn't take it especially in the winter when the temps are up and down and so cold. The customer service is awesome and they are always there to help or answer any questions. Thanks TYH!!! Use this product to alleviate back muscle spasms due to scoliosis and fibromyalgia . I've been using Fibre-Care™ for years for my fibromyalgia pain. It works! When I run out, my pain returns. I highly recommend this product. I have taken Fibro-Care™ for at least 20 years, ever since I was diagnosed with fibromyalgia. I tried many drugs prescribed for fibromyalgia over these years, and Fibro-Care™ has been far more helpful than any of them. I now need to increase my calcium, so I recently have started to take Fibro-Care Cal™. I've always received great service, and appreciate products that I know will provide more absorbable ingredients than others. I was introduced to TyH by my Rheumatologist, she suggested I try Fibro-Care™ for my fibromyalgia. I have been taking it for 3 months now, and I can tell a big difference in my pain level. I also found 5-HTP which helps with mood, energy, and more! I am in the middle of taking my first bottle and already can feel the difference. I've been able to get more done around the house and my mood has been more positive and happier. I love these products so much that I encouraged my daughter to give them a try. She ordered her first product a few days ago. Thanks TyH for providing the best products at an affordable price! I have really relied on Fibro-Care™ over the years as one of the main staples of my fibromyalgia management repertoire and use it faithfully 3 times a day. It makes a major difference in my body's ability to fight and overcome pain and fatigue. It also contributes to my continual success at being healthier without having to rely on a lot of harmful drugs. Thank you so much for this wonderful natural remedy and the difference it has made in my life! June 15th, been on Fibro-Care™ for 14 years and can't have a life without it and you. God gave me you as a life saver and through him you have made my life so happy. Thanks for all you do and God bless. Thank you for providing a product at such a reasonable cost. I had been on Lyrica for my fibromyalgia, but it was very expensive, had side effects and wasn't helping that much. This is my 3rd order of the Fibro-Care™ and it is definitely making a difference. I have been taking Fibro-Care™ for 15 years now. Fibro-Care™ helped me to overcome chronic fatigue and has continued to make me feel well. I have been using Fibro-Care™ for many years now and will continue for many more. Keeps me going! Because of TyH I have been a winner since June of 1999. Fibro-Care™ allows me to work and run my Florist. Without this amazing company and products and the wonderful folks who work there I would be in bed all the time like I was most of my life. Thank you TyH!!! I am not able to take any anti-inflammatory pain meds for my fibromyalgia because of kidney issues. Fibro-Care™ has been such a help. Now I have added Curcumin ES™. TyH brand works so much better for me than a brand I had purchased somewhere else. I am so grateful for the work TyH puts in to develop supplements that are better absorbed. I also enjoy the Health Points magazine. I like Fibro-Care™. I see Dr. Mark Pellegrino and he recommended it. It does help with sleep and pain. I wouldn't be without it. I have used Fibro-Care™ for many years. On occasion, I didn’t order more in time, and I definitely felt more sluggish, including having difficulties with my bowels. I have recommended this product to many of my friends who struggle with constipation. I really enjoy the Fibro-Care™ or shall I say it works! I had been having chronic neck pain and the upper thigh pain for months and couldn't figure out the cause of my pain. I began taking the Fibro-Care™ and within a week the pain in both places was completely gone! Thanks!! I have been using TyH products for fibromyalgia since the company started. I started with Fibro-Care™ but have branched out into other areas and use about 15 different products regularly and I am also trying new ones all the time. I love the quality of the supplements and feel I can trust them. I've been a loyal TyH customer for 21 years. About year six I ran out of Fibro-Care™ and thought I'd try an experiment to see if I felt any different. In less than a week I was in a full flare; couldn't place an order fast enough! Since then, I've never taken a chance in running out. I truly believe that Fibro-Care™ is what keeps me functioning at maximum capacity. I'm grateful for having discovered To Your Health all those many years ago, and plan to continue being a faithful and grateful customer for many, many more years. Thank you Margy and David! I have been a long time customer and have used Fibro-Care™ for many years. I believe it has helped me manage my Fibromyalgia and wouldn't be without it. WOW! With rare exception, thanks to Fibro-Care™ I have enjoyed 20 years of pain-free living. The best part is that there are NO side effects. I enjoy gardening, camping and hiking. No pain meds, no ice packs, no hot water bottles. In fact, I just came inside after 2 hours of working in the yard and garden getting ready for spring. My husband also says thanks to TYH... you are truly a wife saver. Thank you Dave and Margy for the e-mails. God Bless you both and how you help others including myself. Your Multi-Gold™ is a monthly staple for my 94 year-old mom and I. No joke: I take 3 in the morning and I have energy all day and last the entire day, when I don't I have to have a nap. Even one a day. The Fibro-Care™ I don't take like I should but it definitely works when I consistently take the supplement. Fibro-Care™ is my most favorite product of choice. I have used it for many years now, and feel that is why I can manage my fibromyalgia symptoms. I shop with TyH because of the prompt service and great customer service! I am 27 years old and have been diagnosed for 3 years,but have probably had Fibromyalgia since my teen years. I use Fibro-Care™ – what I like about it is that it combines a lot of the supplements I wanted to take in one. It is from a company that I trust more than off the shelf. I like that it is double-blind tested and started by a fibro couple/caretaker. My favorite product is Fibro-Care™, it's really wonderful! It's helped me with my fibromyalgia and arthritis. I've been using it for many years, 10+, and I'm very happy with the products. I really appreciate your company. Fibro-Care™ seems to be helping me a lot! Thanks!!!!! I have suffered with Fibro since 1993 and was delighted to find anything that helps. I am able to be more active and really appreciate that. Thank you for making this product so easily available and affordable. My favorite product is Fibro-Care™. I have been taking it for at least 17 years and it really changed my life. The constant dizziness and weakness left me. I got more energy. I've tried other products and loved them also. On the advice of Dr. Fanto and Darice Putterman I began using TyH Fibro-Care™ and Valerian Rest™ more than 14 years ago. TyH products are consistently high quality and have made a markable difference in how I feel. It is with extreme confidence that I use TyH products and recommend them to others. 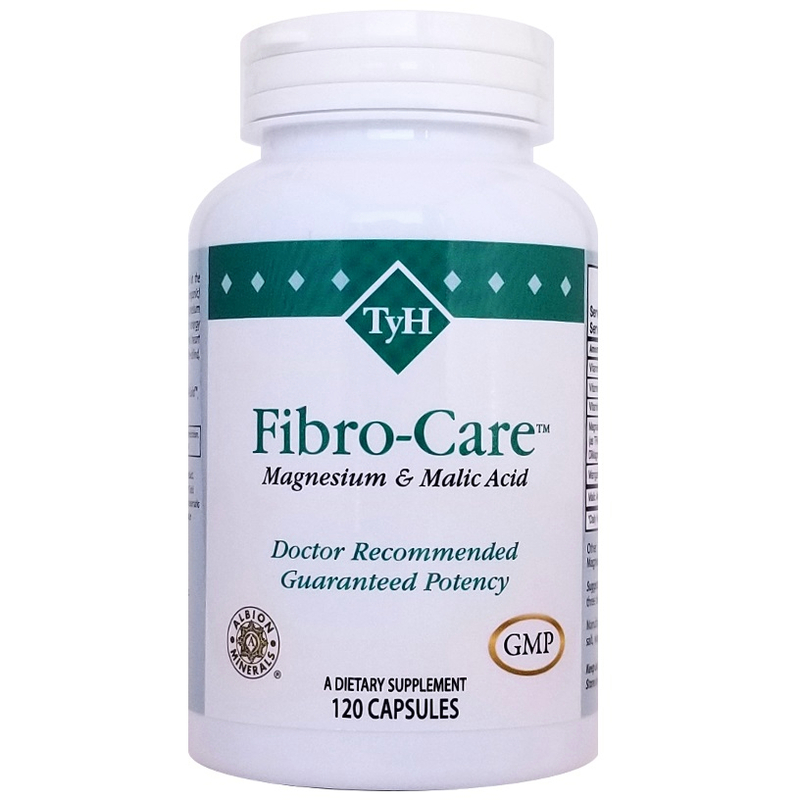 I order the Fibro-Care™ Magnesium and Malic Acid to support muscle health. I have been a customer of To Your Health for many years. Fibro-Care™, supplements and a commitment to yoga and exercise have made a significant difference in the quality of my life. I am able to manage the symptoms of fibromyalgia. Thank you TyH! I have used Fibro-Care™ in the past and have found it to be of the utmost in quality as it helped me manage fibromyalgia pain. I have recommended TyH to friends and family members over the years. Thank you, TyH for producing quality products that help me feel healthy. My favorite product is Fibro-Care™. It really helps to manage my pain. I've used TyH products for at least 10 years. I trust them! It's hard to find a company now a days that you can say that about. I've tried and used several different TyH products, but my favorite that I could not do without is Fibro-Care™! I take my Fibro-Care™ every day, religiously. It gives me energy to get through the day. I really don't want to go back to the way I felt 10 years ago before I started taking Fibro-Care™! It has made such a difference in my life! With Fibro-Care™, I am able to work. It has also improved my immune system. I can't remember the last time I was sick. I did not receive any significant relief from fibromyalgia until I began taking Fibro-Care™ from TyH. That was almost 20 years ago. I still take it twice a day, as well as several other supplements from TyH. TyH has been a lifesaver for me! Fibro-Care™ is my favorite product. I found out about TyH from reading Dr. Pellegrino's book Fibromyalgia Up Close and Personal. Since switching to Fibro-Care™ from a different magnesium product I have experienced improvement in my FMS pain. Thank you for your excellent product and thank you for a free bottle! My favorite TyH product is Fibro-Care™ as it does wonders for muscle pain and spasms. I have been using Fibro-Care™ and Valerian Rest™ for several years now to treat my fibromyalgia symptoms. Valerian Rest™ improves the quality of my sleep much more than the other valerian products I have tried. I have only been using your products for a few months but have been very pleased with the results thus far. The Fibro-Care™ and CoQ10 100 products have been the most beneficial to me. I find TyH's information to be quite informative and helpful in managing my current health issues. I greatly appreciate the excellent customer service you provide. Thank you again. I started using Fibro-Care™ when a friend who also had fibromyalgia recommended them. Since that time I began using other products including the Multi-Gold™, alpha lipoic acid, L-Carnitine, Resveratrol Complex, Eye Complex, phosphatidyl serine, Acidophilus ES™, Fibro-Enzymes™, and last but not least, my favorite, Fibro-Ubiquinol™ with d-limonene. The Fibro-Ubiquinol™ greatly relieved my fatigue from fibromyalgia, and arthritis and a sleep disorder. I am so grateful to have found this company and I enjoy speaking to Channing. I really know that all TyH vitamins are winners, but I especially love Fibro-Care™. Ever since I was diagnosed with FMS quite a few years ago, I sincerely believe that it was, and still is the reason why I have no signs of this syndrome anymore. I run 4 miles a day, but I also changed my diet. I also love Multi-Gold™, because it covers basically everything. I also use Valerian Rest™, and I can go on forever. God bless TyH. I shop with To Your Health because of your Fibro-Care™. This product is reasonably priced and provides the extra magnesium and malic acid I need to help control my fibromyalgia. Also, with all the publicity about people not getting enough magnesium, Fibro-Care™ also fills this need. I like your fast delivery of the product after I order it and your newsletter. I have been using Fibro-Care™ for almost two decades to control my CFS and fibromyalgia. I feel that this supplement, more than anything else, has increased my energy and made my pain more manageable. Doctors are often surprised that I require no pain medication other than an occasional Tylenol®. I have recommended Fibro-Care™ to patients and doctors alike and will continue to do so. Thank you so much for manufacturing it and making it available to us at such a reasonable price! Thank you to everyone at TyH! My mother-in-law who also has fibromyalgia recommended Fibro-Care™ to me. I have been taking it for about 4 months. I did not notice a change until about my 3rd month, then WOW! I no longer take any of the prescription medicines my doctor had prescribed for me. Thank you TyH. I am delighted! I have become a huge fan of Fibro-Care™. I've taken it for about 3 months now and it DOES seem to make a difference having all of the combinations of supplements that we need in ONE capsule form! There was a time I couldn't get out of bed, because I have Fibromyalgia. I don't really know how I learned about your company, but all I know is when I started to take Fibro-Care™ with some of the other TyH vitamins that I have been taking through the years, I am now a functioning human being. I exercise every day, and country dance. You would never know I have Fibromyalgia. Thank God for TyH. Many years ago when I was so sick and the doctors couldn't find out what was wrong with me, I found your site by doing my own research. It has been a life saver! After being so weak and sick, I recovered with the knowledge and supplements I found from your information. To this day, no medical intervention has ever helped as much as Fibro-Care™! I can't thank you enough. You literally were the reason I improved and was able to raise my children and go back to work part time. I've been a TyH customer for many years. Fibro-Care™ has helped me through some painful times. I know it works. Without them my pain level starts to rise again until I get back on them. With Fibro-Care™ and exercise I can keep fibro flares mostly under control. I also like the quality of your other supplements as well. I like all the info on the new website. I can just refer to the website when I want to look up a related article before trying a new product. I have been a customer for several years. The product that I would say is my favorite is Fibro- Care™. It really does help with the Fibromyalgia. I use several products. I trust TyH with almost everything I need. I have a whole shelf of TyH products! The best ones for me have been Fibro-Care™ and Olive Leaf ESE™. The products have been so outstanding I could write a book on them! I recommend your company to a lot of people who come through my office. Thank God for Fibro-Care™ – it's gotten me through the last 7 years! My favorite product is Fibro-Care™. I've been using it since I was diagnosed with fibromyalgia over 20 years ago. It helps me tolerate my muscle pain. I've tried stopping it a couple of times, thinking it wasn't helping, but each time my pain was worse & it reminded me how much it helps! Now that I'm in menopause, I started using the Fibro-Care Cal™. I'm able to get the extra calcium I need along with the help for my fibromyalgia pain. I was diagnosed with Fibromyalgia in 1991 when almost no one thought it was a real syndrome, my only relief at the time was physical therapy which was very expensive and somewhere about a year or two later I discovered TyH and Fibro-Care™. It was such a relief to have something that helped along with being active to keep my muscles loose. Along the way I have added Multi-Gold™, Fibro-Care Cal™ and David’s 5-HTP SR™. I am 71 and am able to live a fairly active life with a lot less discomfort than in the past. I thank God everyday for Fibro-Care™ and TyH for helping me feel better and with a lot less flare-ups. Whenever I come across someone who has been newly diagnosed with fibromyalgia I always tell them to at least try Fibro-Care™ and give them a catalog and/or your email address. I have used your products for years and especially like Fibro-Care™, Fibro-Ubiquinol™, and the 5-HTP. They have kept me functioning pain free. Once again, thank you for your wonderful products. Since I finally received the fibromyalgia diagnosis, after 7 years of symptoms and many doctors, I have appreciated the availability of the TyH products, especially Fibro-Care™, so much. I have found supplements to be extremely beneficial in the management of the symptoms, and have been able to work part-time for 25 years.